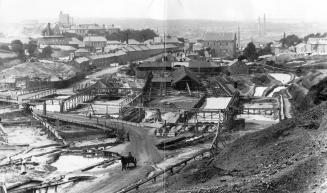 Tuckingmill valley of the Red River (Cornwall, UK) in the 1890�s showing the tin dressing floors. All tailings were disposed of in to the river. MMC undertook a river survey in the 1990�s as a baseline prior to the county council undertaking remediation work to prevent flooding.